Do Be Do Bead Do: Woot Woot! 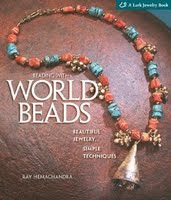 Thanks to Heather Powers and the other wonderfully talented ladies at the Art Bead Scene blog, my name was drawn from the hat to win the wonderful book at left Beading with World Beads. Hop on over to Heather's site for some wonderful polymer clay beads that are truly one of kind and visit Art Bead Scene for fun monthly challenges, gorgeous art bead eye candy and terrific tutorials. Thanks again, Heather and ABS. Congratulations!! The book looks like a good one!